Trading computers typically work much harder than normal computers and should have a superior cooling system for the entire computer, but with special attention given to the processor. You want your computer's case to be large enough to allow air to freely pass through it and cool all the components. You also need enough fans to keep the air moving everywhere to avoid hot spots. To cool the microprocessor you need a much better cooler than the free one that comes from Intel with the processor. The free Intel coolers are barely strong enough to keep the newer processors from getting too hot and will greatly limit the turbo speed. 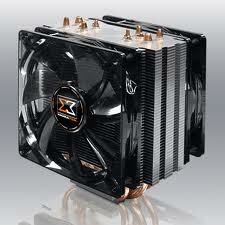 Liquid cooling systems are more effective but much less reliable than air coolers. We prefer not to use the small pre-packaged liquid coolers due to their poor reliability over the life of the computer (we tried them all). Some air coolers, like the Arctic Breeze and Arctic Storm units used on Falcon trading computers, outperform most of the liquid cooling units on the market today while also leveraging the high reliability of air cooling.